Fifty-eight CITY DOGS sit patiently in their cages at the Cleveland City Kennel with visions of soft couches, warm fires, endless treats and people to love them dancing in their heads. 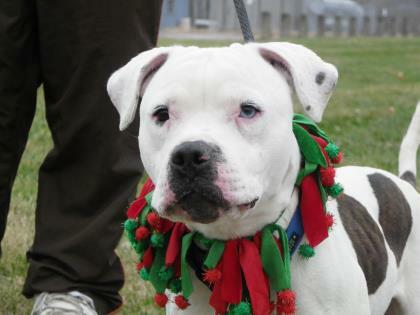 To help their dog dreams come true and fulfill some human dreams as well, the Division of Animal Care and Control is hosting a special “Bring a CITY DOG Home for the Holidays” adoption event. From today until December 31st, you can add a temperament tested, spayed or neutered, vaccinated, microchipped CITY DOG into your family for just $51.00. You can check out all of the adoptable dogs at www.petango.com/cacc, email citydogs@city.cleveland.oh.us to arrange a meet and greet, or stop by the Cleveland City Kennel at 2690 West 7th St. between 10:00 am and 3:00 pm Monday through Saturday or 12:00 pm – 2:00 pm on Sundays. The CITY DOGS will be waiting with a lifetime of love to give. For more information, call the Adoption Hotline at 2165.664.3476. CITY DOGS Cleveland is a program of The City of Cleveland’s Division of Animal Care and Control (CACC). The CITY DOGS mission is to increase adoptions from the City Kennel by changing the image of the pit bulls who make up the majority of the kennel population, by preparing all adoptable dogs in the kennel for lives in loving homes and by creating as many opportunities as possible for the public to meet and get to know our dogs for the terrific pets they are meant to be. For more information please visit www.facebook.com/CityDogsCleveland.